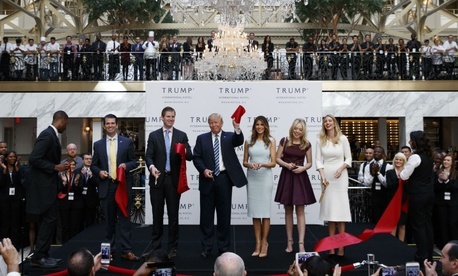 Neither the private Trump Organization nor the General Services Administration are talking publicly about still-unresolved issues surrounding President Trump’s unusual lease arrangement at the federally-owned building housing the Trump International Hotel. So late Wednesday, a team of attorneys concerned about the president’s “unprecedented” deal in which, they say, he is both landlord and a tenant reaping benefits, took a new tack. They filed a tort complaint in the District of Columbia Superior Court on behalf of two D.C. restaurateurs alleging unfair competition. Diane Gross and Khalid Pitts, who since 2008 have run the award-winning Cork Wine Bar and Cork Market & Tasting Room on 14th Street Northwest, appeared on Thursday at the National Press Club with attorneys with specialties in business law, the Freedom of Information Act and government procurement. The complainants and the attorneys point to the many foreign dignitaries and political organizations that have “flocked” to book events at the Trump hotel as a way to “curry favor.” Even Trump himself has been there to greet some of them. Washington “is a company town, and the president is the principal, so why wouldn’t one go to an event at a place the president is known to frequent?” asked Pitts. He and his wife, who employ 45 staffers, have watched their patronage flag since Trump’s election, they said, judging by normal expectations for such occasions as the inauguration. The small-business owners and the attorneys declined to put a dollar figure on the damage, and are not seeking financial redress, only an injunction, attorneys said. They are not addressing the alleged breach of the lease, nor are they citing, as other legal challengers have, the emoluments clause of the Constitution, which prohibits office holders from receiving gifts from foreign governments, noted longtime Washington attorney and organizer Alan Morrison. Possible remedies, said attorney Mark Zaid, could include Trump divesting himself of the hotel, resigning from office, or halting the functioning of the restaurants. He said it will be easy to serve papers on the Trump representatives inside the hotel, but tougher to serve Trump himself, who is named as a defendant. “Serving the president may be more difficult because I don’t want to be tackled by the Secret Service,” Zaid said. Other legal groups that have entered the fray on the Trump hotel, such as the ACLU and Citizens For Responsibility and Ethics in Washington, have not been seen to have legal standing, the Cork restaurant attorneys noted. This is one reason they filed in D.C. Superior Court. Democratic lawmakers have repeatedly pressed GSA for a ruling on the Trump lease and continue plans for an investigation of the circumstances. A GSA spokeswoman did not respond to inquiries by publication time. One of the agency’s key players in the issue, Public Buildings Commissioner Norman Dong, left the agency on Wednesday, The Washington Post reported. The White House referred inquiries to the Trump Organization, which did not reply.